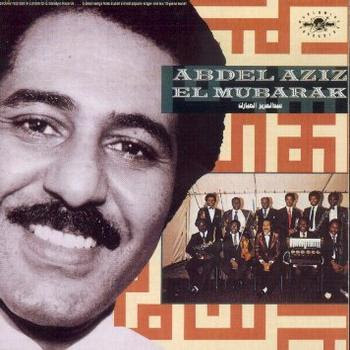 I was lucky enough to catch Abdel Aziz el Mubarak at the Hackney Empire in the summer of 1989. A recording of the show later landed up as the World Circuit release Straight from the Heart. But it was the self-titled recording on Globestyle records a few years earlier that first got me. To be honest I wasn't sure what to expect when I arrived at the Empire but soon enough he appeared on stage dressed to kill in a black suit and bow tie. The formality seemed to suited the Empire and its slightly distressed interiors but it seemed slightly off-putting and a touch cold. But it wasn't long before he had most of us in the palm of his hand. Seriously swinging. Seriously Sudan. Not for the weakhearted. Good to see this! I have not listened to either of those recordings in a very long time. I remember when I bought the live album, on a recommendation from John Storm Roberts' Original Music catalog, and how I played it over and over again. Years later, I saw the CD you've featured in a discount bin and snatched it up. still one of my favourite albums! i saw the band around the same period at the Sfinks festival near Antwerp, Belgium and it was a blast! i am glad the album is still in print - AHLA EYYOUN is my favourite track! Sorry to put this in comments, but I can't find an email onsite to send it direct to you. Thought this might be right up your street. A new Fansite just set up to celebrate the release of Nigeria Special: Modern Highlife, Afro-Sounds & Nigerian Blues 1970-76 on Soundway Records. www.nigeriaspecial.info - Try it out for widgets galore all on Nigerian groove! Cheers and Miles passes on his best. Also, when is the next podcast? I am Nicolas Moncadas and maybe you heard of me on Voodfunk last post (Beware mp3). Very interesting blog! Thank you all this nice stuff.